On June 25, 1948, President Harry S. Truman signed into law the Displaced Persons Act of 1948: “This act helped those individuals who were victims of persecution by the Nazi government or who were fleeing persecution, and someone who could not go back to their country because of fear of persecution based on race, religion or political opinions.” Truman was deeply committed to bringing European refugees both into safety and into the United States. The Displaced Persons Commission ran from June 25, 1948 through August 31, 1952. 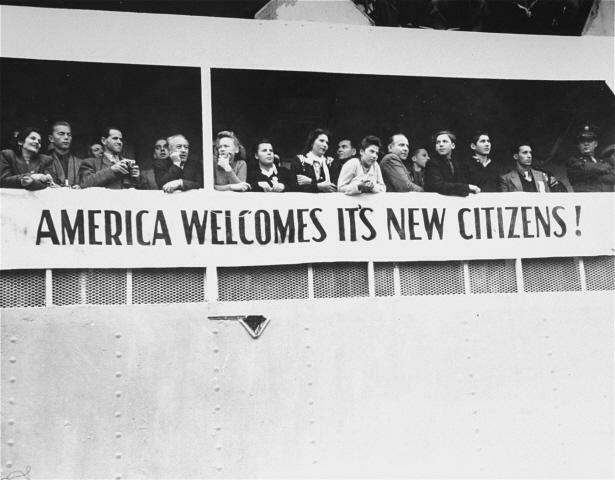 My parents and I left Europe and came to the United States under the Displaced Persons Act. We came as refugees. Contrary to today’s rhetoric, my parents did not “love America” before coming, and, frankly, I doubt that they ever loved America. They weren’t nationalists, and so didn’t love any country. They loved their family members, who due to the Holocaust numbered six, and they loved their friends. At some point, they might have said they loved justice or democracy or even the working class, but they actively rejected loving any nation-State. They came, they made a life, they raised a family, they died and are now buried together. I have to say I am glad they did not live to see the day in which a Muslim ban on refugees and immigrants more generally was announced and implemented. While they did not “love America”, they knew State violence and they despised it. They despised those who promulgated it and they despised those engaged in it. They taught their children to recognize State violence and to oppose it. Their children do, as do their grandchildren. Any restrictive program that targets a particular population is racist and comes from and intensifies an ongoing history of racist State violence. Some in power will try to finesse this. Don’t let them. Only 1% of refugees are resettled – why are we so threatened by them?